The value of Estimated Breeding Values and Selection Indexes has been explored in a joint project between Angus Australia and the MLA Donor Company. Angus BREEDPLAN Project Officer, Ashleigh Horne said the project had emphasised the value of performance recording, genetic evaluation and selection in the seedstock industry. The project has shown that EBVs are reliable indicators of the genetic merit of each animal. “Using informative tools such as EBVs and Selection Indexes, producers are able to readily select animals with superior genetics, subsequently increasing the rate of genetic gain in their herd and achieving long term sustainable genetic improvement,” Miss Horne said. “Australian Angus producers have been dedicated to collecting quality performance data on a regular basis. To see proof that EBVs are doing a good job is such an encouragement. It reinforces that each producer’s investment of time, effort and money into collecting quality information is worthwhile,” she said. The project used data sourced from the first three cohorts of the Angus Sire Benchmarking Project (ASBP), encompassing about 40 sires joined to 2000 cows per cohort (25 progeny per sire). 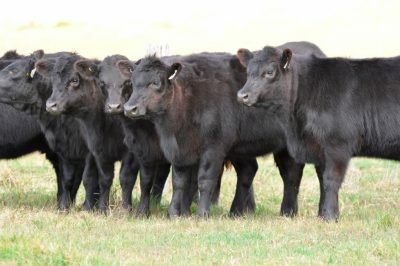 Several key concepts were explored, including the amount of genetic variation between Angus bulls, and whether the EBVs of young Angus bulls are accurately predicting the performance of their progeny. “The project demonstrated there was great opportunity to make genetic improvement through careful bull selection, with considerable differences being observed in the progeny from different bulls,” Ms Horne said. For example, the progeny from the highest five performing sires for yearling weight had progeny that were on average 35kg heavier than the progeny from the five lowest performing sires. At a sale price of 300c/kg, this equates to a difference of $105 per animal. Similarly, the project demonstrated that the EBVs of sires when entered in the ASBP reliably predicted the subsequent performance of their progeny. “We found that most sires will perform as predicted by their EBV, and while some individual sires may perform better or worse than predicted, the EBVs will on average, provide a reliable indicator of the genetics that sires are delivering to a breeding herd,” she said. Angus Sire Benchmarking Program chairman, Ross Thompson said as someone who had been supplying bulls since the beginning of the project, it was terrific to see that the BREEDPLAN model is surprisingly accurate across the average Angus population.